If the ice at One Mile Lake is safe and the weather's in our favour, we will celebrate with heaps of on and off ice activities at One Mile Lake. Come out and enjoy a little or a lot of Winterfest. ​With a variety of winter fun for people of all ages, there's sure to be something just for you! *A selection of free skates will be available at the Information Tent. ​If Mother Nature is not on our side, we've got something else up our sleeves. Check out our Downtown Barn Schedule of Events. Ice Skating – Free skate for all ages. There will be a selection of free skates available for use at the Information Tent. Hockey – Come one and all for a game (or two) of pick-up hockey. Bring your pucks and sticks! Live Band at the Legion - Come and dance the night away at the Pemberton Legion. Whistler's own 'Jon Shrier & The Ones That Made It Happen' will perform live for what promises to be a great night! There will also be a draw to win a Big Sky Golf Package. Show starts at 10pm with doors at 9pm. Entrance by $5 ticket donation. Tickets on sale at AC Gas and the Legion as of January 6. Live Band at the Prospect Pub - Northern Ignition - winners of the 2016 Pemberton Music Festival "Be the Best, Play the Fest' competition - will light up the stage at the Prospect Pub on Friday night. The Pub promises a Winterfest drink special and the doors open at 9pm with the show starting at 10pm. Entrance by donation. 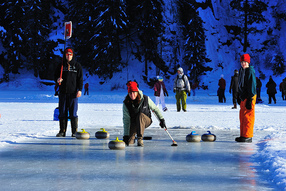 Curling – Try your hand at curling, a truly Canadian sport! Equipment provided by Arid Irrigation…fun provided by you! Kids Zone – Looking to take a break from all the fun on the ice? Stop by the Kids Zone tent for face painting, crafts and more between 10am-2pm. Winterfest Adventure Hunt - We're working hard to create the ultimate Winterfest Adventure Hunt - a mobile app based scavenger hunt around Pemberton. The Adventure Hunt will require teams to check in (via GPS), take photos and answer questions at various locations around town. Teams are encouraged to dress up and a smart phone required to download the free app. Check-in from 1-2pm, Adventure Hunt from 2-4pm. Presented by Fix Auto. Much Music Video Dance - It's back - the Much Music Video Dance Party! This event is open to 13-18 year olds and will be hosted at the Pemberton Community Centre. The dance will take place from 6pm - 10pm. $10 entry fee. Fireworks – Come watch as we light up the sky with fire during our spectacular fireworks display at One Mile Lake. Fireworks will begin at 8pm. Live Band at the Prospect Pub - Whistler's ultimate duo, The Hairfarmers are back in action at the Prospect Pub on Saturday night. Doors open at 9pm with the show starting at 10pm. Free admission! 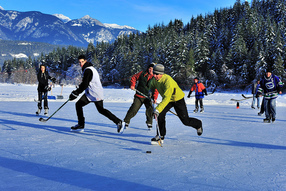 Hockey Tournament – The Shinny Hockey Tournament will take place on Sunday, January 22. Free registration opens at 9am with the tournament taking place between 10am-1pm. And yes, there will be awards for the winning teams. Bring your sticks! Curling Tournament – On Sunday, January 22 sign-up for our free Curling Tournament sponsored by Arid Irrigation from 10am-3pm. Prizes will be awarded. 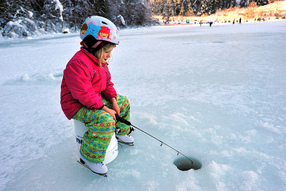 Family Ice Fishing Derby– Our Family Ice Fishing Derby hosted by Pemberton Fish Finder will take place from 10am-3pm on Sunday, January 22 with a cash prize of $250. Free entry, everyone welcome! Kids Zone – Looking to take a break from all the fun on the ice? Stop by the Kids Zone tent for crafts and more between 10am-2pm. Polar Bear Plunge – On Sunday, January 22 at 11am we host the ever popular (and free) Polar Bear Plunge. Everyone who plunges will receive free hot chocolate and a toque. Prizes will awarded for the best costumes. ​Innergex Warming Hut - Innergex will once again be onsite with their hot chocolate and a cozy warm tent. Be sure to visit before and after the Plunge!